According to a new report North America Universal Flash Storage Market, published by KBV research, the North America Universal Flash Storage Market Size would witness market growth of 16.7% CAGR during the forecast period (2017-2023). The US market holds the largest market share in North America Removable Universal Flash Storage Market by Country in 2018, and would continue to be a dominant market till 2023; growing at a CAGR of 17.2 % during the forecast period. The Canada market is expected to witness a CAGR of 18.7% during (2019 - 2023) in North America Embedded Universal Flash Storage Market. Additionally, The Mexico market is expected to witness a CAGR of 17.6% during (2019 - 2023). The Smartphones market holds the largest market share in North America Universal Flash Storage Market by Vertical in 2018, and would continue to be a dominant market till 2023; growing at a CAGR of 15.9 % during the forecast period. The Digital Cameras market is expected to witness a CAGR of 16.4% during (2019 - 2023). 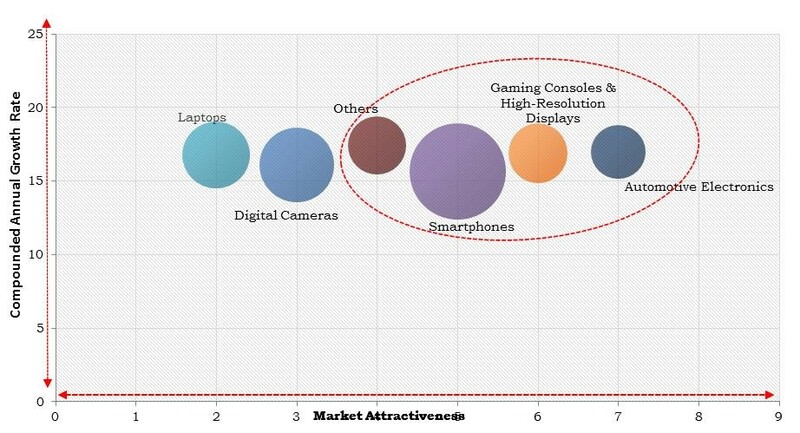 Additionally, The Gaming Consoles & High-Resolution Displays market is expected to witness highest CAGR of 17.2% during (2019 - 2023). The 32 & 64 GB market dominated the Mexico Universal Flash Storage Market by Capacity in 2018, and would continue to be a dominant market till 2023; thereby, achieving a market value of $54.7 million by 2023. The 256 GB market is expected to witness a CAGR of 19.9% during (2019 - 2023). The 128 GB market would attain market value of $33.1 million by 2023. The market research report has exhaustive quantitative insights providing a clear picture of the market potential in various segments across the countries in the region. The key impacting factors of the North America Universal Flash Storage Market have been discussed in the report with the competition analysis and elaborated company profiles of Samsung Electronics Co., Ltd., Toshiba Corporation, SK Group (SK Hynix, Inc.), Micron Technology, Inc., Phison Electronics Corporation, Inc., Silicon Motion Technology Corporation, Synopsys, Inc., Cadence Design Systems, Inc., LTI (GDA Technologies Inc.), and Arasan Chip Systems Inc.